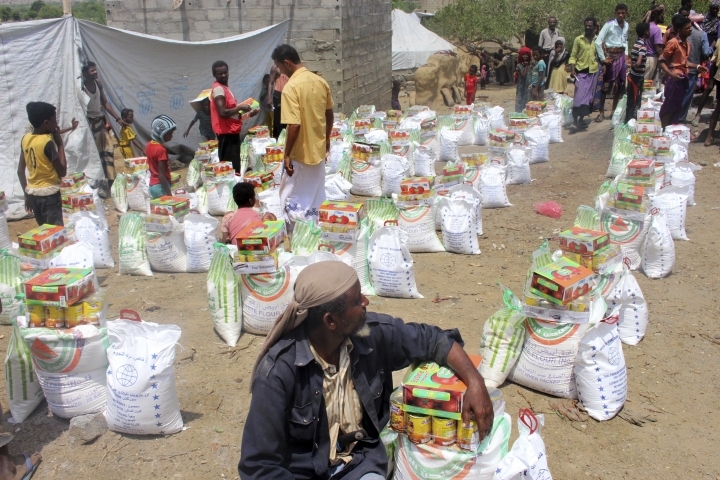 CAIRO — The United Nations and individual donors are rushing food to a desperate corner of northern Yemen where starving villagers were found to be living off leaves. Aid officials are searching for ways to ensure aid reaches those in need amid alarm that the country's hunger crisis is worsening beyond the relief effort's already strained capabilities. The aid push was directed at a district called Aslam where The Associated Press recently found some families eating leaves, partially due to local authorities manipulating aid distribution and resisting requests to set up biometric registration for those receiving assistance. 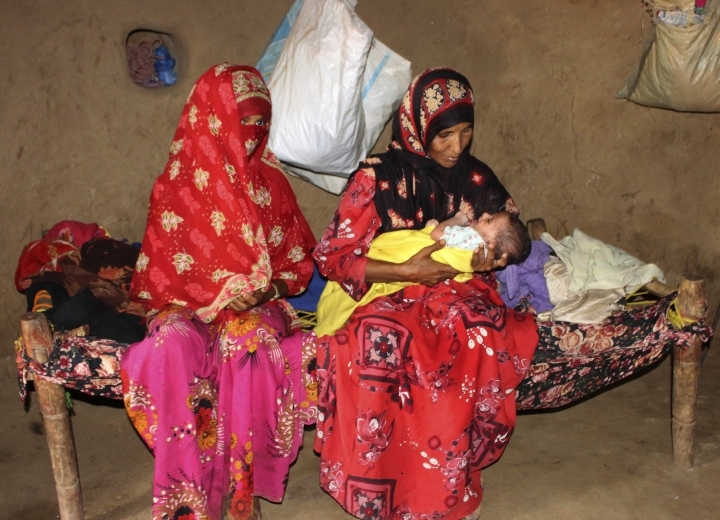 In a sign of the difficulties in tracking Yemen's near-famine, conditions appeared to be as bad or worse in a neighboring district, Khayran al-Maharraq. On a recent day, Shouib Sakaf buried his 3-year-old daughter, Zaifa, the fifth child known to have died in the district this year from malnutrition-related illness. 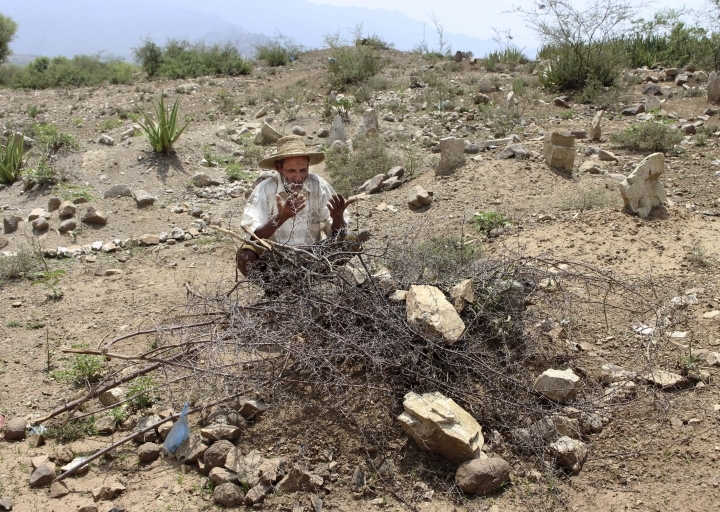 Sakaf prayed over a grave marked by piles of stones and tangled, dry branches from the surrounding mountain shrubs. Zaifa was as old as Yemen's civil war, waged between rebels known as Houthis and a coalition led by Saudi Arabia. Born in the war's early days, Zaifa succumbed to the humanitarian crisis it has caused — widespread hunger, the collapse of the economy and the breakdown of the health system. In her final weeks, she wasted away, her ribs protruding, her face and feet swollen. At a local medical facility which did not have enough supplies, her father was told she had to be taken to a hospital further away to treat kidney complications. He had no way to pay for transportation there. "Death came at 2:30 p.m.," Sakaf said with a deep sigh. "Then we left." U.N. humanitarian chief Mark Lowcock issued a dire warning to the Security Council on Friday, ahead of the world body's General Assembly, saying, "We are losing the fight against famine" in Yemen. "We may now be approaching a tipping point, beyond which it will be impossible to prevent massive loss of life as a result of widespread famine across the country," he said. "We are already seeing pockets of famine-like conditions, including cases where people are eating leaves." Across Yemen, around 2.9 million women and children are acutely malnourished; another 400,000 children are fighting for their lives, in the same condition as Zaifa was. This year, the U.N. and humanitarian groups provided assistance to more than 8 million of the most vulnerable Yemenis who don't know when their next meal will come. That is a dramatic expansion from 2017, when food was reaching 3 million people a month in the country of nearly 29 million. 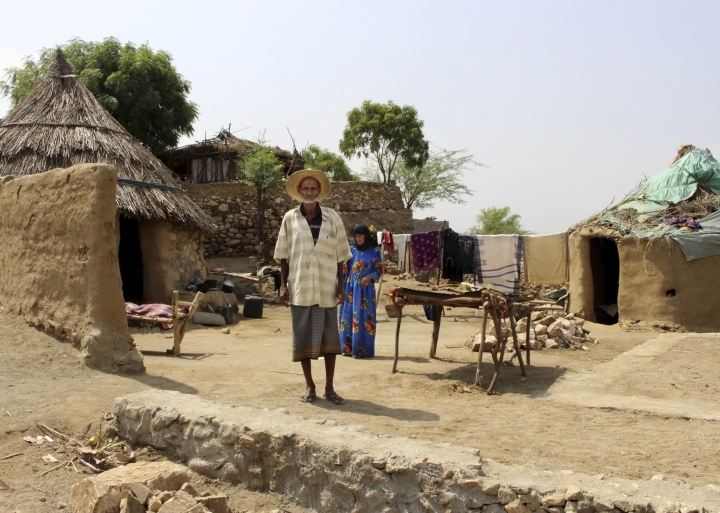 Lowcock spoke after the AP alerted U.N. relief officials to the villagers in Aslam district, an isolated area in Hajjah province. After the AP report, activists launched an online campaign called: "Rescue Aslam" with bank account details to collect donations. Some 30 food baskets financed by individual donors were distributed over the past days. The U.N.'s World Food Program carried out an investigation in Aslam and found that aid hasn't been reaching all targeted beneficiaries. It has since sent trucks carrying 10,000 food packages to the district, each meant to feed one family for a month. Distribution of the aid is still pending the finalization of registration lists. Getting relief to those in need has been complicated because international agencies are required to work from lists that are often compiled by local Houthi authorities. Critics accuse those authorities of favoritism in putting together the lists. Stephen Anderson, the director of the WFP, said there is a "retargeting exercise" underway to make sure that "the poorest and hungriest and most marginalized people, wherever they are, are targeted first." The agency is introducing a biometric registration to establish a database of beneficiaries, including their finger prints to avoid forgery and duplications. Anderson said the system "will help give us an assurance" that situations like those in Hajjah are prevented or at least minimized. A senior relief official said local authorities have resisted implementing biometric registration and the main Houthi-run aid body, known by the acronym NAMCHA, has sought to do the registration and control the database. The official expressed concerns about the Houthis' pushback. "They put a condition we can't accept," he said, speaking on condition of anonymity because of fears of problems with authorities. The conflict in Yemen, the Arab world's poorest country, began with the 2014 takeover of the capital, Sanaa, by the Houthis, an Iranian-backed Shiite movement that toppled the internationally recognized government. The Saudi-led coalition launched to fight the Houthis has imposed sea, land, and air embargo while waging a devastating bombing campaign. The conflict has left more than 10,000 civilians dead, driven millions from their homes and sparked a cholera epidemic. U.N. officials have warned that millions more could very quickly become unable to feed themselves. The rapid depreciation of the currency, the rial, has caused food prices to rise at least 35 percent. Government salaries have largely not been paid for two years. Officials also fear a coalition-led assault on the Houthi-held port of Hodeida could shut it down. 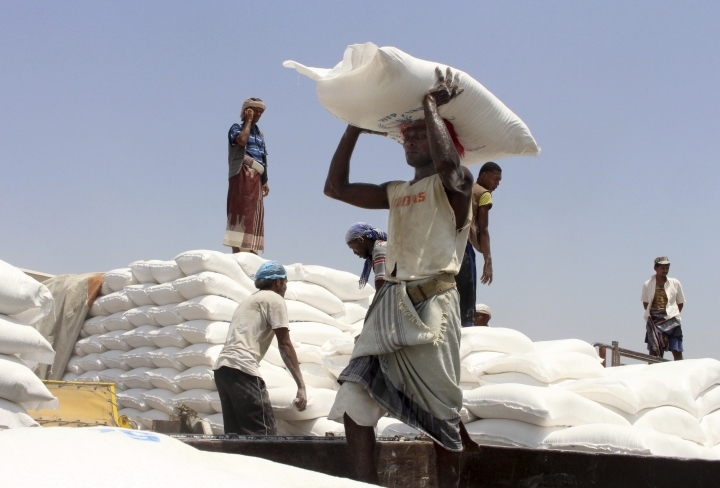 Nearly 80 percent of Yemen's imports come through the Red Sea city, including much of the humanitarian aid. At least 20 children are known to have died of starvation already this year in Hajjah province, where Aslam and Khayran al-Maharraq districts are located. The real number is likely far higher, since few families report it when their children die at home. Khayran al-Maharraq district is one of the most densely populated districts in Hajjah, with some 100,000 people, including many displaced from Hodieda and war-torn border areas. Cholera hit the area hard last year and doctors fear another wave of the disease with the rainy season coming on. Six people have died of cholera since August, according to Mekkiya Mahdi, head of Aslam's health center. An official at Khayran al-Maharraq hospital said the facility receives more than 60 cases of severe malnutrition a month, but has to send them elsewhere because it has no supplies. A local aid worker said WFP aid covers some 3,700 families in the district — "only the most needy, and even those are not entirely covered." He said food baskets sometimes arrive with expired grain. UNICEF has also done two cash distributions to 5,000 people — one equivalent to $15 each, the other $30, he said. Most families need four bags of flour a month, each costing the equivalent now of $20. He and the hospital official spoke on condition of anonymity, wary of hurting ties with authorities or agencies. Anderson, of the WFP, said the agency is planning to scale up assistance to cover 43,000 people monthly as of November. WFP is also going to re-assess the situation in Khayran al-Maharraq, to get a "more accurate snapshot of the food security situation," he added. 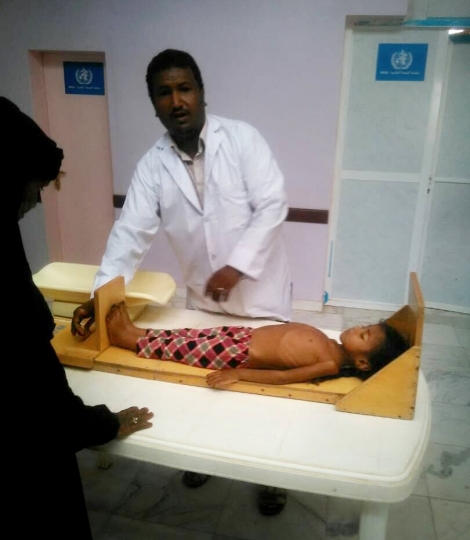 Hajjah's top nutrition official, Mohammed al-Faras, said the number of children under five with severe acute malnutrition in Khayran al-Maharraq this year reached 874, out of a total of 19,500 children under five there, or 4.5 percent of all the children of the district. "The percentage is high," al-Faras said. Zaifa began to deteriorate from hunger last month. On Aug. 29, her family took her to the Aslam clinic, where she was diagnosed with severe acute malnutrition. "You could count the ribs of her chest. She was all bones," said her mother, Amna, who has seven other children. Days when her husband, a laborer, can't find work, they skip meals. "Some nights if I have a little bit, I give it to my children while we grown-ups sleep hungry," she said. "We are patient."